You haven't lived until you've tried rumbledethumps. This traditional Scottish dessert is a heavenly (and calorific) blend of whisky, whipped cream, honey, and fresh raspberries topped with toasted oatmeal. This hearty dish is is made with leeks, chicken stock, and barley. It's often referred to as "Scotland's National Soup". The word "clootie" means cloth, and refers to the fact that this traditional suet fruit pudding is wrapped in linen before being boiled for a couple of hours. Crowdie is similar in texture to cottage cheese, but much tastier. Legend has it that it has the power to prevent a whisky hangover if it's eaten before a drinking session. A smokie is a flavour-packed, strongly smoked haddock made in Arbroath, Angus. The fish are salted, hung over a burning barrel, and then sealed in with wet sacks. These meaty treats are pure joy on a cold day. Thick pastry is filled with peppery mutton and then baked in a high round tin, leaving a rim that can hold gravy. This fantastically-named vegetable dish originated in the Scottish Borders. Mashed potato, onion, and cabbage are fried, then baked with cheese until golden brown. Finnan haddie is a variety of smoked haddock made in north-east Scotland. The fish is lightly smoked over green wood and peat to give it a subtle, delicate flavour. This rich, full, and creamy Highland blue cheese is made by the Stones family at their farm in Tain, Ross-shire. It's made with 70% Friesian and 30% Holstein milk. This luxurious, primrose yellow Highland cheese is made with double cream and rolled in pinhead oatmeal. The recipe dates back to the 15th century. Atholl brose is a delicious Scottish drink made by mashing oats in water, straining the resulting 'brose' and combining it with honey, whisky, and sometimes cream. 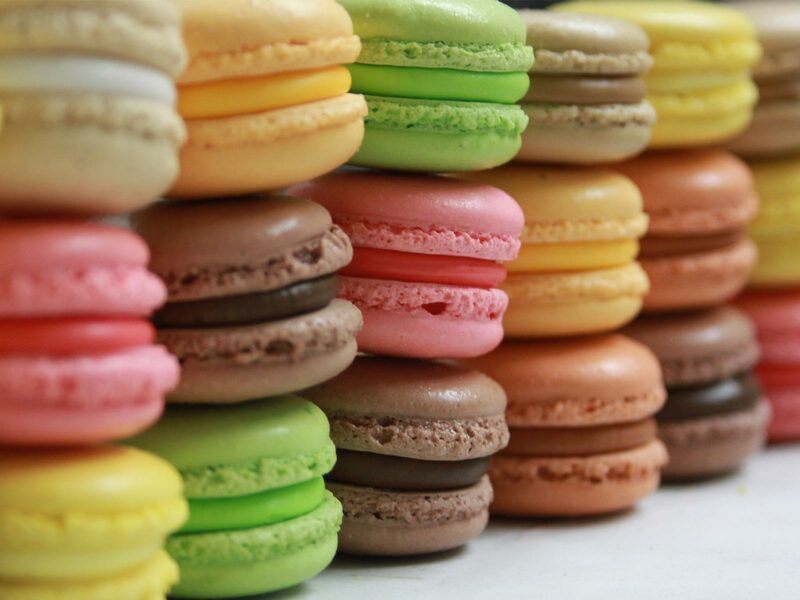 Bright, colourful macaroons like these are very popular, but they're not as tasty as the Scottish version made with coconut, chocolate, and (weirdly) mashed potato. This thick Scottish soup was invented in the town of Cullen in north-east Scotland. It's a combination of potatoes, onions, and smoked haddock (usually finnan haddie). These sugary treats have been made by the Blacklock family in Moffat since the late 1800s. The toffees have a sweet caramel shell and a sharp lemon centre. Hot, filling soups are a great antidote to the Scottish weather, and few are as filling as this broth: A mixture of lamb or beef, vegetables and sometimes split peas. This mild East Ayrshire cheese is made with unskimmed milk. The method was invented by local farmer's wife and inventor Barbara Gilmour in the 18th century. This Scottish dessert is traditionally served on Burns Night. It's made in a similar way to trifle but is made with whisky not sherry, and raspberries instead of strawberries. This famous variety of fruitcake is made with currants, sultanas, and almonds. A Dundee company started to mass produce the cakes in the nineteenth century. This island cheese company is relatively new, but their award-winning flavoured waxed cheddar definitely deserves a place on the list (especially the whisky variety). Stovies (meaning "to stew" in Scots) is a traditional dish made with potatoes, onions, and various forms of meat and other veg, often eaten with home made oatcakes. Heather ale (leann fraoich) has been brewed in Scotland since ancient times, but this particular variety by Williams Bros. was inspired by a 17th-century recipe. These tasty, buttery biscuits were invented by a doctor called John Abernethy in the 18th century. He included aromatic caraway seeds in the recipe to help digestion. What's better than a fruit cake? A fruit cake wrapped in pastry. Black bun is eaten on or around Hogmanay and is similar to a traditional Christmas cake in texture. These butter filled, flaky savoury rolls are basically a Scottish croissant. They were originally given to fishermen; their high fat content means they don't go stale at sea. 25. Haggis, neeps, and tatties. Haggis done well is a revelation. Forget that it's made of innards and enjoy the sweet, salty, spicy, meaty and unique flavour, ideally with a whisky sauce. The Tunnocks Teacake is a fine thing, but finer still are crisp, chocolatey Tunnocks Caramel Wafers: they beat Kit Kats hands down.